Tournaments? That’s Just For The Pros, Right? Well it’s true, anything can be taken to an extreme and as far as I’m concerned if you’re not having fun, you’re not really fishing. But if there is one thing I have learned in decades of Bass fishing, the smartest thing a good fisherman can do is keep an open mind. So after several courteous but insistent invitations, I finally visited a meeting of a local Bass club, Columbia River Bassmasters, met some of the good folks there and listened to their stories. Then, wonder of wonders, I found myself sitting in an idling Bass boat, swirling around in the morning’s half-dark in a holding pattern with dozens of other guys, tossing jokes and good-natured insults back and forth, and waiting for the signal that it was our turn to blast off. Now I’m a guy that usually fishes solo, slipping along and finding isolated, ‘secret’ spots in my Minnkota-powered Old Town Predator canoe, stealthily hunting Mr. Big Largemouth. I do have a good buddy with a really nice Tracker Bass boat all tricked out and sporting a 40 horsepower Mercury outboard. After fishing from my canoe, a trip down the lake in his boat feels like a day at the races. But when it came time to jet up the Columbia River in a tournament Bass boat, I entered a whole new world. As we cut through the waves and my fingers got whiter from clutching on to handholds, it occurred to me that we were quickly passing up traffic on the I-84 Freeway on the Oregon side, zooming past the cars and trucks as a matter of fact, and that the boat seemed to be skidding on the turns…..that’s right, the bends of the river felt more like rapidly disappearing turns. A 200 horsepower motor will do that. I had seen some of the guys wearing helmets and face shields. As my eyes dried out and my cheeks flapped, I understood why. My far more proficient partner – the ‘boater’ who kindly took me as the ‘non-boater’ guest – and I did not win the tournament. But we caught our limit and I actually added some fish that meant we could cull smaller fish from the livewell. I had warned the club guys that I’m just a thumper who might thrash along and only find one big fish in a day’s fishing, so I was relieved to at least be able to contribute a little. What do I value most about my experience of fishing at a higher level and mixing it up with tournament Bass fishermen? The adrenalin of high-speed, run-and-gun fishing is thrilling. The fun and good fellowship with like-minded sportsmen is a real privilege to take part in. I really enjoyed hearing stories from one of the older guys who has fished with legends like Bill Dance and Roland Martin. Watching the care taken to release all Bass back into the river, alive and healthy, made me proud of this sport and the men and women who are so dedicated to it. The mystery and anticipation of each tournament blast-off (Who’s going to win? What strategies and tactics are going to make the big difference? How big a monster Bass will somebody find? ), this makes a man lay awake at night. It was also a revelation to me that this sport requires a level of fitness and endurance that most people are not aware of. I found that the physical exertion and stamina required in tournament fishing are demanding, and until you have stood on the deck of a Bass boat for 8 hours, maybe wolfing down a quick lunch or snack while motoring to the next spot, until you have endured the wind, waves, rain, snow and cold of a Spring day in the Columbia River Gorge, all the while concentrating and paying attention to detail, you might not understand what it takes to compete with real Bass fishing fanatics. These guys are athletes! One inspiring incident of unhesitating good sportsmanship really stands out: You don’t break Tournament rules. They are hard and fast. Yet one morning, one of our guys and his partner had a flat tire, and a flat spare tire, on their way to the early morning start-time check-in. It was announced that they were somewhere along the shoulder of the road, struggling in the dark. All tournament participants immediately voted to delay the tournament until our friends could join up with us. For everyone involved it meant a substantial change in plans from sunrise tactics, baits and fishing spots, but no one complained and everyone was relieved when our buddies showed up to launch. To me, such goodwill and friendship – even among very tough competitors – marks the essence of Bass fishing camaraderie. Okay, maybe a big-money, high-stakes, televised tournament would not make such an exception, but the guys at Columbia River Bassmasters did. Of all these things, the new experience and insights I gained from these fishermen have proven to be a very important contribution to my fishing ability. I mostly pursue Largemouth, believing this species to be the most beautiful and challenging of all sport fish, but local tournament guys go after both Smallmouth and Largemouth, and I had very little understanding of Smallmouth fishing. Boy, did I make a quick jump up the learning curve on Smallmouth! I learned that every tournament fisherman has a tactic in mind, based on time of year, river level, moon phase, barometric pressure, temperature, water qualities, fish movement (Many tournament guys legally ‘pre-fish’ a tournament a few days before, gaining valuable information and being careful not to terrorize the fish population! ), that Smallmouth can be great topwater biters, even crushing big baits like Zara Super Spooks, that they will go after spinnerbaits – even big 1 ounce baits – under the right conditions, that big soft plastic swimbaits fished deep and slow can be deadly on trophy-sized Smallies, that when the jig-and-trailer bite is on you had better have a plentiful supply if you don’t want the rocky bottom of the tackle-grabbing Columbia to leave you empty-handed, that you can ‘burn’ lipless crankbaits incredibly fast and get jarring strikes from mid-river fish holding near rocky areas, that it is possible to successfully fish small finesse baits, even in the big river, and that modifications can make all the difference (For instance, I learned that you can put a piece of contrasting-color soft plastic worm up inside a tube bait, leaving an enticing tail dangling out behind the skirt….and get more bites! ), and that looking for similar river features at successful times of day can help to focus in on a good population of active fish. I learned a lot about Largemouth too. One particularly useful, even critical, piece of information comes to mind: Fishing with 2012 ‘Angler Of The Year’ and Tournament Director Mark Forbes on Washington’s storied Silver Lake, I witnessed an incredible testament to just how sensitive highly-pressured Bass can be. Mark was flipping a jig-and-trailer combo to specific pieces of brush along a shoreline. I had assumed that Mark was really a Smallmouth guy and I was stunned when he put on a demonstration of the most subtle, accurate, relentlessly pinpoint Largemouth flipping I had ever seen. I was embarrassed when I, supposedly a real Largemouth chaser, fumbled, clunked and twangled my baits into the brush. Mark just patiently kept casting, then he pointed out a huge Largemouth cruising the brushline. I held my cast and watched Mark delicately flip his bait out in front of the big pre-spawn female. She immediately descended, on a beeline toward his slowly-falling jig. I was already savoring a first place weigh-in when the re-circulator pump in the livewell chose that moment to come to life. The big fish immediately darted out of sight, not to be found again. If you don’t think out-of-place noises can spook a big fish, you need to consider this tidbit and be a little more careful when stalking that wallmounter trophy! At each monthly meeting of the Columbia River Bassmasters, winners of previous tournaments put on a show and tell, sharing the baits, tactics and other incidentals that made the difference for them. 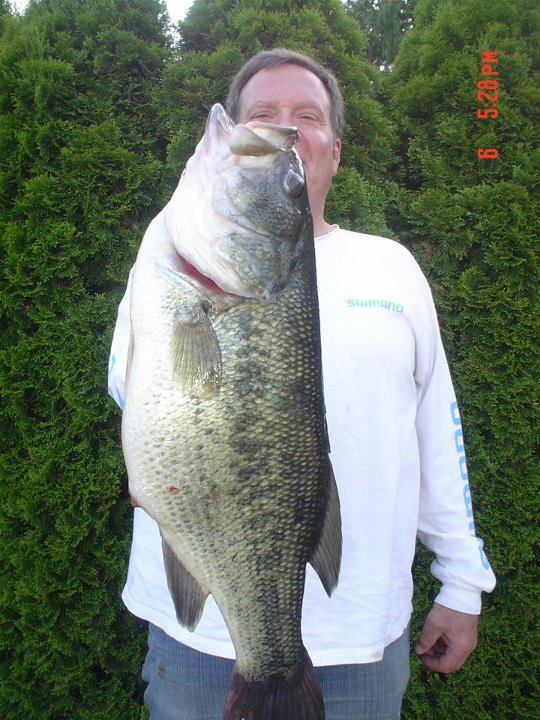 If you want to learn more about Bass fishing from people that really know what they are talking about, you might just want to check out a meeting, the first Tuesday of every month at Bill’s Chicken and Steakhouse in Vancouver, Washington. I have encountered tournament fishermen from other clubs and they have all been fine sportsmen, but I can personally attest to the exceptionally kind, generous, friendly and knowledgeable folks of the Columbia River Bassmasters. Next month, I’ll get into some more details of pre-spawn Largemouth fishing. Those big Bass are getting ready… Are you? Tight lines from your fellow fishing addict, Bassmaster Bob.